The Alentejo Region stretches from the Tagus River at Lisbon, south to the Algarve. Its terracotta earth is covered in wheat fields. Bordered by rows of olive trees marching up and down the rolling hills like Roman centurions. Here and there white washed villages and towns appear, crowned by castles. The ancients left their megaliths, the Romans their aqueducts, the Portuguese a wealth of architecture from Gothic to Baroque. Today some of the old arts and crafts are still practiced in this region; here too cooking and winemaking reflect a rich culinary tradition. In the spring, the Alentejo is carpeted in wildflowers; in the summer, wheat, oats, and sunflowers blanket the fields; in the autumn, grapes and olives ripen. The Refúgio da Vila Rural Hotel and Cooking School, located in Portel, a small town outside Évora. Based in a Vila manor house with pool and patios, guests can relax in elegant rooms between lessons, in a kitchen that opens onto a courtyard, and touring the unspoiled countryside. The program can easily accommodate non-cooking partners. Portuguese cuisine is simple, characterized by a rich variety of regional dishes. Gathering herbs and produce from the local markets and pairing them to the timeless recipes, cooks of all levels can roll up their sleeves in the Vila kitchen and prepare a variety of succulent Mediterranean dishes influenced by this historic region. - Arrival in Lisbon, transfer to hotel by taxi. - Enjoy free time before a Welcome Reception and Dinner this evening. - This morning, we drive to the small Alentejo town of Portel, and Refúgio da Vila, our base for the week. - After an orientation walk around Portel, past the 13th century castle and Baroque Church, and lunch, we`ll enter a Portuguese kitchen and have our first Cooking Class: Introduction to Portuguese Gastronomy, a study in influences and seasonings. - Dinner at Adega do Refúgio. - Cooks, this is your day off! Today well drive into the northen Alentejo, and before lunch at Vila Viçosa, we visit its Renaissance Ducal Palace. - Passing through the marble area we visit the historical and white town of Estremoz, enclosed within its ramparts and overlooks a vast plain of gnarled olive trees and wheat fields. - After passing through Estremoz, we return to Portel in time for dinner. - Today´s focus is on local produce: The Abundance from Local Quintas/Farms and Ranches. - This afternoon, we`ll tour nearby Évora, a UNESCO World Heritage Site, the Cultural Center of the Alentejo, and a beautiful white town with a wealth of monuments, from Roman times to the 19th century. - After a walking tour, you`ll have free time to explore and shop on your own. - After breakfast our third Cooking Class begins: The Importance of fish and Olive Oil in Portuguese Cuisine. Lunch is a chance to sample your own cooking! Non-cooking partners join at the table. 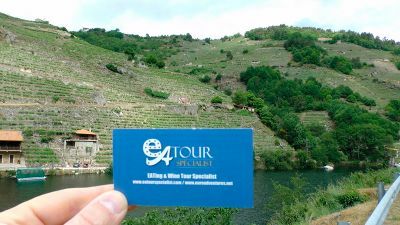 - This afternoon you`ll visit the Esporão Wine State, blending ancient and modern winemaking techniques. - The grapes of this wine region include Periquita, Trincadeira, Tinta Roriz, and Moreto for red wines, and Roupeiro, Manteudo, Perrum, Rabo de Ovelha for the whites - all Portuguese varieties, as well as Cabernet Sauvignon, and Shyraz. - The nearby Arts & Crafts Center of Reguengos displays a wonderful collection of Alentejo wares. - The road winds past megalithic sites to the thousand-year-old village of Monsaraz. Here we`ll dine under the shadow of the 13th century castle built by King Afonso III. - This region is known for its Aromatic Herbs, and wild flowers. - This morning well use them in dishes that the locals have passed on through the generations. - Enjoy an afternoon excursion to several traditional peculiar villages. This evening, sit down to a Farewell Dinner at the Adega do Refúgio. - After lunch, enjoy a siesta and a free afternoon to stroll, ride out on horseback, bicycle, or simply lounge by the pool. - This evening, dinner includes entertainment from a local folklore group. - After breakfast we transfer back to Lisbon. In peaceful country setting of Alentejo can be found Refúgio da Vila Rural Hotel and Cooking School. Located in Portel, a small town outside Évora, the hotel is a housed in a Vila manor complete with pool and patios. Between cooking lessons in a kitchen that opens to a courtyard, and tours of the unspoiled countryside, guest relax in simple, but elegantly appointed rooms.